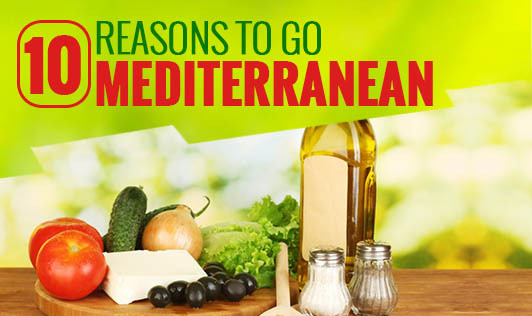 10 reasons to go Mediterranean! Heard about the popular Mediterranean diet? Here's why you should follow it! 1. It is considered to be one of the healthiest diets in the world especially for heart health. 2. It promotes the intake of whole grains, fruits and vegetables. 3. The diet provides good quality proteins in the form of fish, eggs, chicken and nuts. 4. Olive oil, which is used for all types of cooking, baking and salad dressings, is one of the healthiest cooking oils, as it is low in saturated fat and has omega 6 and omega 3 fatty acids. 5. Low fat yoghurt and cheese are included regularly in the diet. These provide calcium and protein, and also make food more interesting! 6. It also emphasizes on adequate water intake to maintain a healthy lifestyle. 7. The key to following a Mediterranean diet is "moderation". It allows you to enjoy all kinds of food in moderation. 8. If you drink alcohol, here's good news! Mediterranean diet also allows moderate intake of wine with meals! 9. Mediterranean diet is not only a diet but a lifestyle. Regular exercise is a part of this diet which ensures good health. 10. Last but not the least, it encourages family meals or meals with the company of loved ones as it is believed that food becomes more enjoyable, pleasurable be savored with company! Are you ready to go Mediterranean?? ?